Since becoming a ‘Less is More’ type of person when it comes to my wardrobe and being a capsule wardrobe advocate it led me to the road of ‘Slow Fashion’ and then to the #30Wears campaign. This was started by Livia Firth(Colin Firth’s wife) who is creative Director of Eco-Age, and goes hand in hand with the documentary The True Cost. If you haven’t watched this (its available on netflix and lots of formats) I highly recommend giving it a watch. Its definitely an eye opener. Watching the documentary was thought provoking. As a youngster we didn’t have lots of money. I had my little Saturday job at a hairdressers and earned my way to buying myself the odd top or skirt. Then in the years when I started going out-out I had one a pair of jeans and one denim mini skirt (which was all the rage back in the day) and just 4 tops which I rotated. We would be out every Friday and Saturday night, living it up and having a blast. Me and my bestie Charlie would sometimes clothes swap our tops just to mix it up. Going out and having an absolute ball was what was important to us. The emphasis was never on the clothes. Yes we liked to look good, but we were never afraid to wear the same thing again and again. It was just the done thing. Fast forward to today. Every day a new outfit can be expected. If you look at teens these days, they’re being brought in to a consumer driven market, telling them they need a different outfit every time they show their faces. Not only are the impacts of this devastating (I will leave you watch The True Cost to see why, otherwise we will never get through todays post as it’s already of epic proportions) But also detrimental to girls and women. I’ve seen teens stressed at being judged and mocked for wearing the same thing. Serious anxiety over outfit repeats. Why is this happening? So I am pledging to start wearing my clothes more and being proud of my outfit repeats. #30Wears is a brilliant concept to get women to be proud of wearing their clothes often. Slowing fashion down and shopping more sustainably. I bought this dress at the end of last summer. It was ALL OVER social media and I just loved it, the paisley print, the bright red and the little pompom finish, just totally got me, hook, line and sinker. But since wearing it once for an outfit post last year I have not worn it again. Why? I have no frickin’ clue. Its lovely, I love it! 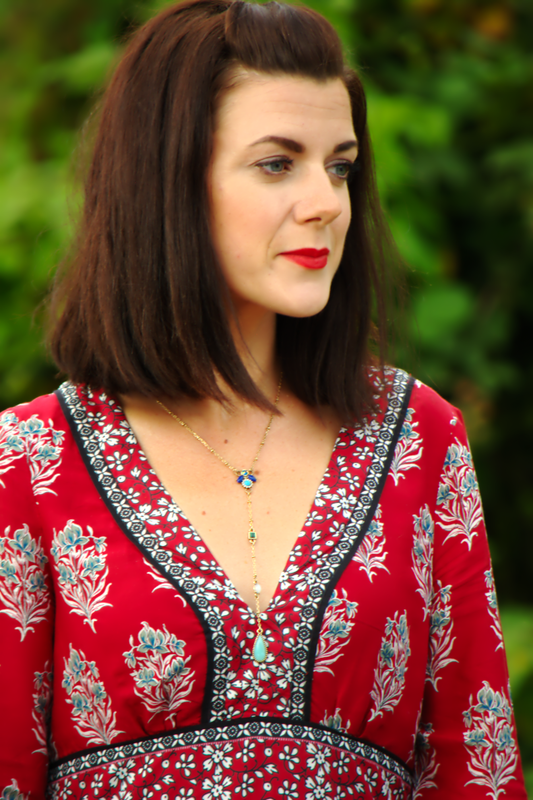 Its not easily re-mixable as its such a standalone piece and therefore I may have thought it un-blog worthy as I’ve already worn it on the blog.. But, ITS SO PRETTY! This dress has so much more wear in it, why not wear it again and again. I wore this yesterday and I had so many compliments. I am pledging to wear this dress more. I am indeed pledging to wear all my pieces more (which I can hand on heart say I do with my capsule wardrobe, as you don’t have a choice but to wear them!). I’m thinking about putting this dress in to my autumn capsule as it would transcend in to cooler months so well, picture some knee high boots and a chunky cardigan.. Nice right? Or an investment piece from Ulla Johnson would work so so well, look at the second row, the red dress is beautiful and would work so well for lots of wears. What are your thoughts on #30Wears ? I’d love to know what you think! 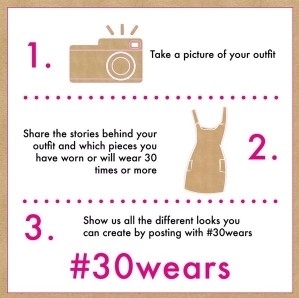 I love the idea of #30wears. I do have pieces that may not ever see 30 wears, but my rule for buying something is that I have to be able to immediately come up with three outfits with the piece and/or have a cost per wear of less than $4 per wear. Most of my clothing is worn down to less than a $1 per wear. It gets tricky with blogging but I love remixing. I probably need to see that documentary. I know that I've started putting more thought into my buying and that's at least a step in the right direction. I LOVE that dress … it's amazing on you, Rachel. Stunning, girl, you! I hear you. I didn't see the film yet, but I've read Overdressed, Wear no Evil and To Die For (by Lucy Siegl, which incidentally mentions Livia Firth quite a few times as they know each other well) and I just couldn't anymore. Fashion just wasn't the same afterwards. Mind, I already did a lot of remixing, rewearing and some capsule experimentation, but now I don't look at certain offerings anymore and think "shiny". I think "ergh". Not only am I loving the #30wears campaign but I love that you're an advocate as well Rachel! So many bigger bloggers are rarely seen repeating anything unless it's a purse or pair of shoes and usually because of a contract they signed. Clothing companies and their marketing team want to trick women into thinking they closets stuffed with clothes and that re-wearing them is a sin. 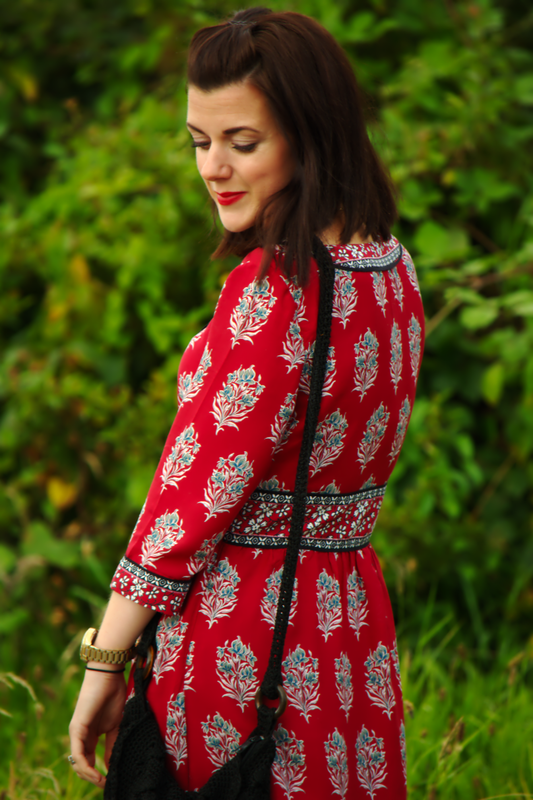 I'm always re-wearing things on my blog and encouraging women to do the same. I mean if you look and feel amazing in something why only wear it once? I enjoyed reading this thought provoking post. I know I own far too many clothes and have put myself on a shopping hiatus so I can wear what is in my wardrobe more often. I know I have pieces I have only worn once or even never at all. You look positively gorgeous in this dress and should wear it more often. I can completely see it with a chunky cardigan and boots. Perhaps you could even throw a shirt or sweater over it and wear it as a skirt? Such a pretty dress! It definitely deserves to be worn a lot more! I can also totally picture it in your fall capsule wardrobe! Such a gorgeous dress! You styled it perfectly and you look beautiful in it! Red is your color! 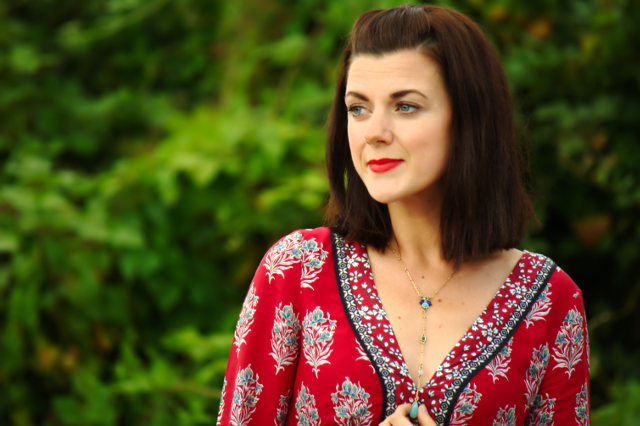 I'm so glad you've worn this gorgeous dress again Rachel – it'll look great in AW with boots and tights (and a roll neck)?! Red is soooooooo your colour! Thank you for hosting us and have a great weekend! A great campaign. And I look forward to seeing more of this dress. It's gorgeous. The irony is that even though, now days, we own so much, we often have a core bunch of staples we wear often – I suppose we have to ask why the staples can't suffice? I do love my non-staples though. But you're right, we need to wear them more. (I use the 'thrifted' card often to justify my desire for more items, better that it could be but not as good as I should be). Thanks for the thought provoking post. This dress is gorgeous. I love the color, it looks stunning on you! I really love this look on you! Your dress is lovely and I love the bolod colors! I do remember when the outfits were simpler growing up. It wasn't until high school that I began to put stock in what I wore. What a nice campaign. I haven't seen the documentary but I'll definitely watch it. The whole fast fashion approach is easy to get sucked into but I'd rather have a foundation of good quality, timeless pieces and add a few on trend items here and there. The dress is beautiful and would look great with boots in autumn…such is our weather you never know what we're going to get! Its definitely important to rewear your clothes. And oncce you don't wear them anymore, donate them so someone else can enjoy! I sit in amazment when I see some bloggers in a new dress or outfit for days on end. I have a fair amount of clothes, but have been sending some to charity if I dont wear them. I am more thoughtful over the past few years of what pieces I want to build in my wardrobe. 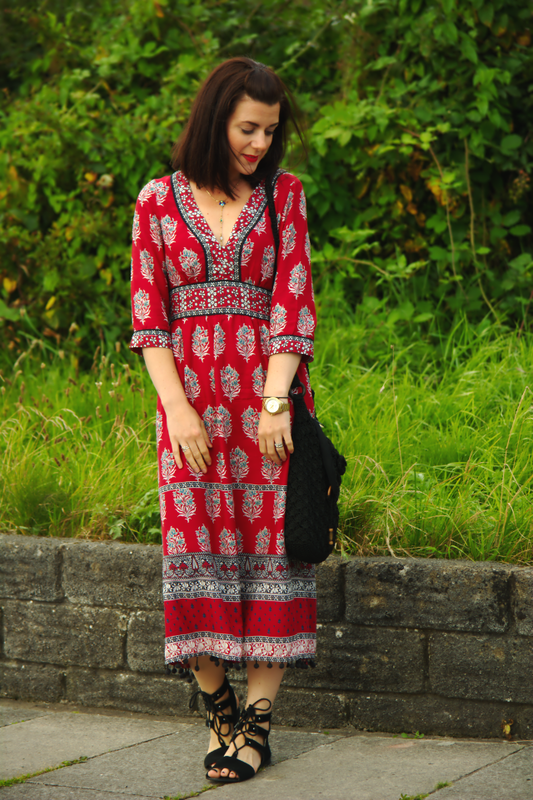 I love this red dress o nyou, great pattern and so pretty with the black sandals. I like the idea of the 30+ challenge! This is a super cute dress! I love the pom poms on the bottom! Thanks for the information. What can you say about weebly? As a newbie and hobby-blogger, I chose weebly over wordpress for ease of use. Will it be good for long term?